New model luxury Adria Twin 600SP bus camper from 2016 for rent. Adria Twin 600 SP – New model luxury Adria Twin 600SP bus camper from 2016 for rent. Looking for a young, luxurious and tough bus camper? Look no further, we offer our Adria Twin 600 SP for an unforgettable holiday. The big advantage of this bus camper is that it is compact with a length of 5.99 meters. This makes it very easy to drive with this camper. Parking and driving in narrow streets is also very easy. Behind the wheel you can enjoy all the comforts such as cruise control, air conditioning, comfortable seats, the included camper navigation system (free of charge) and the strong and reliable 130 hp Fiat engine. Once at the destination you can enjoy all the luxury you can find in the camper area. The seating area is spacious and comfortable for four people. In good weather you can also sit under the awning on the provided chairs and table (free of charge). The kitchen has two gas burners, a work area and a large sink. Next to it you will find the fridge with freezer. In the back you will find the comfortable and fixed double cross bed. The table and the seating area can be converted to a third smaller bed. In the lockable bathroom you will find a toilet, shower and sink. Through the information system you can monitor and adjust all functions. This allows you to set the heating to time, temperature and blowing power, to heat the water and to keep an eye on the water supply. All windows and roof hatches are fitted with screens. The windows can be darkened with pleated curtains. The camper also has a trigas alarm, ramps and bike carrier. Before your trip you will receive detailed instructions about the operation of the camper and the device. You will also receive a handbook in which everything is explained and we can be reached by telephone with questions. We are very happy with and proud of our camper and want to ask tenants to treat our camper respectfully. We charge a standard cleaning fee of € 50 because we want to know that you are traveling with a shiny camper and do not want to depend on the cleaning skills of the previous tenants. However, I request that you empty the waste water tank and empty the chemical toilet and clean it before returning it. If that is not the case, unfortunately € 50 must be charged. During the high season the minimum rental period is 2 weeks. Rent is possible from one week in mid and low season. 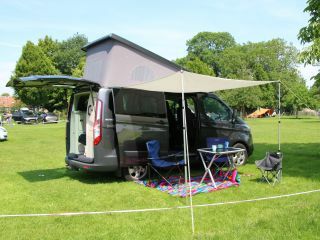 Nice new buscamper Ford Nugget (4-5 pers), including bustent to rent!